At least 13 American soldiers were among more than 20 people killed when a Taliban suicide car bomber attacked an armored NATO shuttle bus in Kabul on Saturday, a Western military official confirmed. It was the worst loss of life among American troops in the capital in several years. The attack on the bus, known as a Rhino because of its heavy armor, took place in front of the American University on a route often traveled by military trainers from NATO bases in downtown Kabul to the Kabul Military Training Center. 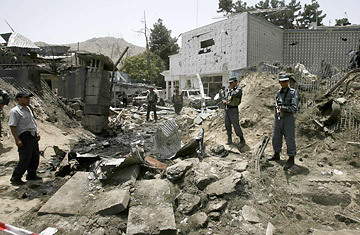 At least eight civilians were reported among the dead, including three Afghan police officers and two children. A military dog was also killed, the military official said. A Taliban spokesman, Zabiullah Mujahid, claimed responsibility, saying that a suicide bomber named Abdul Rahman Hazarbos drove a truck with 1,500 pounds of explosives into a bus carrying foreign military trainers, killing all aboard. He claimed 25 NATO soldiers were killed in all. In addition, three Australian NATO soldiers were killed on Saturday by an Afghan soldier who turned his weapon on them, Afghan officials said. A spokesman for the NATO-led International Security Assistance Force confirmed that the attack had caused casualties, both to NATO forces and to civilians, but would not provide details about the victims or their nationalities.